This really is the dogs dinner! 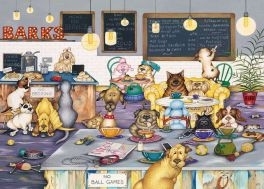 With only a quick howl for service, these doggies can rest their weary paws and enjoy all manner of delicious treats. Includes half size portions for puppies and free Woofi and not a cat to be seen!Artist of Barks Cafe, Linda Jane Smith, is renowned for painting puzzles of cheeky kittens causing havoc, so this puzzle is takes a step in the other direction and is perfect for any dog lover!